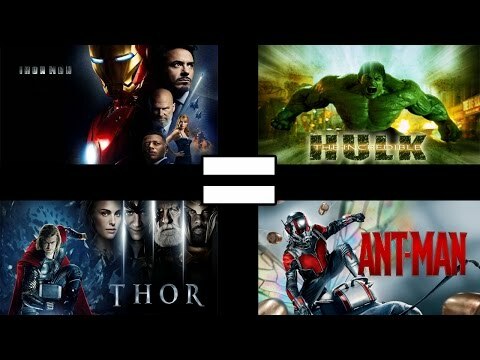 This list points out tropes and cliches used in all of the 12 movies in the Marvel Cinematic Universe (from 2008's Iron Man to 2015's Ant-Man). This list is only intended to tie common tropes found in the Marvel films made by Marvel Studios, not the Marvel films created by Sony or Fox. Guardians of the Galaxy (2014): The only film where we don't get an Avenger cameo. Thor: The Dark World (2013): A flashback scene with Bor, Malekith, and Kurse. Ant-Man (2015): Pym quits S.H.I.E.L.D. Iron Man (2008): Obadiah Stane hires a terrorist group to kill Tony Stark. The Incredible Hulk (2008): General Thunderbolt Ross hires Emil Blonsky to capture Bruce Banner. Iron Man 2 (2010): Justin Hammer hires Ivan Vanko to create armored military suits. Thor (2011): Loki works with The Frost Giants and The Destroyer to take over Asgard. Captain America: The First Avenger (2011): The Nazi creates Hydra and it becomes a Nazi rogue science division with it's own agenda. The Avengers (2012): Loki is recruited by The Other, Thanos' personal assistant to lead his Chitauri army against the Avengers. Thor: The Dark World (2013): The Dark Elf Malekith and the enhanced warriors known as the Kursed. Captain America: The Winter Soldier (2014): The Winter Soldier operates under Alexander Pierce's command. Avengers: Age of Ultron (2015): Ultron builds an army of robots, he's also joined by the Maximoff twins because of their common hate for Tony Stark. Ant-Man (2015): Darren Cross sells his Yellowjacket technology to Hydra members. The Incredible Hulk (2008): General Thunderbolt Ross wants to conduct tests on Hulk to develop more super soldiers. Iron Man 2 (2010): Justin Hammer wants to mimic Tony Stark's Iron Man technology. Thor (2011): Agent Sitwell, whose later discovered to be a Hydra member, is left in charge of security over Thor's hammer. Captain America: The First Avenger (2011): Johann Schmidt underwent an earlier "super soldier" treatment from the same doctor that operated on Steve Rogers. He suffered permanent negative side effects. The Avengers (2012): Loki steals S.H.I.E.L.D. 's tech used to power the tesseract and brainwashes Erik Selvig in order to stabilize the cube. Iron Man 3 (2013): Aldrich Killian wants funding and research from Tony to fix the flaws in Maya Hansen's Extremis Formula. Thor: The Dark World (2013): Malekith is hellbent on stealing the Aether weapon that was safeguarded by Odin's father within a stone column. Captain America: The Winter Soldier (2014): Project Insight is 3 next generation helicarriers with high powered repulsor engines created by Tony Stark. Hydra tried to use Stark's technology to have Zola's algorithm wipe out all threats to Hydra. Guardians of the Galaxy (2014): Peter Quill locates the orb, which an Infinity Stone in it's interior and this causes bounty hunters and villains to track him in order to get the orb. Avengers: Age of Ultron (2015): Ultron brainwashes Dr. Helen Cho, an ally of the Avengers, to steal her Cradle technology in hopes of getting a humanlike body. Ant-Man (2015): Darren Cross goes mad trying to recreate Pym's shrinking technology. Captain America: The First Avenger (2011): Johann Schmidt and Hydra abandoned the Nazi to start his own conquest of the world. The Avengers (2012): Hawkeye & Erik Selvig double crosses The Avengers & S.H.I.E.L.D. Thor: The Dark World (2013): Loki double crosses his sibling and father to sit on the throne. Captain America: The Winter Soldier (2014): Hydra members double cross S.H.I.E.L.D. 11 out of 12 of the MCU films have "daddy issue" themes. Captain America: The First Avenger is the only film to avoid the underlying theme. Iron Man (2008): Stark says "he never got to say goodbye to my father"
Iron Man 2 (2010): Tony Stark resents his father until he finds out his past project was dedicated for him. The Avengers (2012): Tony says "that's the guy my dad never shut up about" when referring to Captain America and Loki's scheme is a result of the scars left from his brother and father following the events in Thor. Thor: The Dark World (2013): Loki's ordered to prison by his father because of his attack on New York in Avengers. Captain America: The Winter Soldier (2014): We learn Nick Fury inherits his aggression from his grandfather (not his father) after he tells a story to Captain America on the elevator. Guardians of the Galaxy (2014): Peter Quill was raised by a single mother, but learns hints of who his father was at the end of the movie. Avengers: Age of Ultron (2015): Ultron hates Tony Stark and Stark refers to himself as Ultron's "ol' man" since he created the A.I. robot. Ant-Man (2015): Scott Lang can't see his daughter because of missed child support payments. Also, Pym's daughter was the deciding vote that pushed her father out of his own company. Captain America: The First Avenger (2011): Steve Roger was denied enlistment due to poor health. The Avengers (2012): Nick Fury loses control of S.H.I.E.L.D. and higher powers send a rogue bird to drop a nuclear missile in New York. Thor: The Dark World (2013): Thor rejects Odin's offer to sit on the throne and rule Asgard. (If it means anything, Loki was impersonating Odin at the time). Captain America: The Winter Soldier (2014): Captain America and Black Widow are banished from S.H.I.E.L.D. and become fugitives. Guardians of the Galaxy (2014): Ronan the accuser opts out of his alliance with Thanos. Avengers: Age of Ultron (2015): Iron Man and Hawkeye announce their retirement from The Avengers. Ant-Man (2015): Henry Pym is voted out of his company by Pym Tech's board of directors. Iron Man 2 (2010): placed on house arrest by S.H.I.E.L.D. The Avengers (2012): Thor gets trapped in a containment unit designed to hold The Incredible Hulk. Iron Man 3 (2013): Iron Man is captured and held prisoner by Killian's men. Thor: The Dark World (2013): Loki is held prisoner because of his crimes in 2012's Avenger's but is freed to aid Thor. Captain America: The Winter Soldier (2014): Captain America, Falcon, and Black Widow are captured by Hydra and Maria Hill rescues them. Guardians of the Galaxy (2014): The Guardians of the Galaxy are placed in prison. Avengers: Age of Ultron (2015): Black Widow is put in a jail cell by Ultron. Ant-Man (2015): Scott Lang is arrested by his ex-wife's new husband.